Drinking raspberry leaf tea has been shown to alleviate menstrual complaints, bronchitis, various intestinal problems and in particular diarrhea. For a sore throat or inflamed mouth, gargle with the lukewarm tea. The common garden raspberry, Rubus idaeus is part of the rose family and grows from late spring to midsummer. Often people choose to cultivate the shrub for its berries, but you can also find it growing wild in woodland areas. While there is no doubt that the deliciously sweet berries are the most popular part of the raspberry plan (the syrup from the fruit is even used to flavor many medicines), many herb experts know that the leaves are valuable as well. 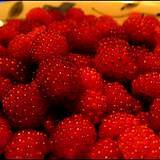 In the year 37 A.D the curative powers of raspberry leaves were first recorded by the Roman historian, Pliny,. Then, as today, the leaves were used to make raspberry leaf tea. Simply add some fresh raspberries to your herbal teas and you'll notice a refreshing distinct flavor, full of rich vitamins and antioxidantsl. Raspberries are used in so many different recipes, like the photo above, have you ever heard of raspberry vinegar? Caution: Raspberry leaf tea stimulates the uterus and is said to facilitate childbirth. Under your doctor's supervision, drink 1 cup of raspberry leaf tea when contractions begin. Never drink the tea early in pregnancy! 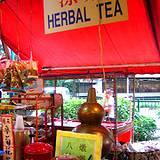 For more medicinal tea recipes and benefits go the Grandma's Medicinal Teas . The tannins in raspberry leaf tea have an astringent effect, which gives the tea its anti-diarrheal and anti-inflammatory capabilities. It also helps stop bleeding. The tea makes a valuable nutritional contribution because it contains potassium, calcium, phosphorus and vitamins A and C.
In order to take full advantage of the healing components in raspberry leaves, it is best to steep the dried, crushed leaves in cold water for a few hours, then boil the mixture for 10 minutes before straining. Use 1 teaspoon per cup of water. Drink as many as 3 large mugs of the tea daily. See caution above. Add 2 teaspoons of the herb mixture to a cup of cold water; allow the tea to sit overnight, then boil it for 10 minutes and strain. This tea is particularly good for stomachaches caused by stress or anxiety. Never give children an herbal tea with peppermint. The menthol in the peppermint can have an adverse effect on children. Use 1 teaspoon of this herbal tea mixture per cup of hot water for a tea or sitz bath. This mixture may normalize menstrual bleeding in a gentle and natural way. 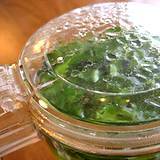 Use 1 teaspoon of the herb mixture per cup of hot water and strain. This herbal tea will strengthen the bladder muscles and also calm anxiety. 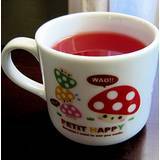 Give your child 1-2 cups in the early evening. Raspberry leaf tea was traditionally used in folk medicine to treat wounds, purify the blood, promote the flow of bile, and ease menstrual complaints, such as cramps. This tea is also valued for its ability to aid nausea and stomach upset, strengthen the gums and alleviate the symptoms of flu and tonsillitis. The abundant tannin content of raspberry leaves has an astringent effect on the intestinal walls, thereby helping the irritation caused by diarrhea. To ensure a high concentration of tannins in the tea you make, boil the leaves in water for at least 10 minutes. A raspberry leaf decoction is a home remedy for inflamed or oozing skin. The tannins in the leaves can shrink blood vessels and stimulate skin regeneration. Because the decoction is a mile disinfectant, I can help prevent bacterial infections. 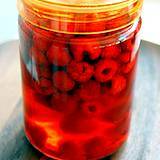 To make the decoction, add 3 tablespoons of raspberry leaves to 1 quart of water and boil for 10-15 minutes. Allow the tea mixture to cool. Wash, soak or use compresses on the affected parts of the skin with the mixture several times daily. 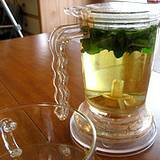 For a sore throat or laryngitis, briefly boil 1 teaspoon of raspberry leaves in 1 cup of water. Allow tea to cool. Gargle with the tea several times daily. You can enhance the effectiveness of this herbal tea by adding some calendula flowers and a few sage leaves. A mixture of equal parts of raspberry leaves, fumitory green parts and dandelion root can purify and detoxify the blood. Pour 1 cup of boiling water over 1 teaspoon of the herbal mixture and steep for 10 minutes. Drink it 3 times a day. Add a blend of 3 tablespoons each raspberry leaves and white deadnettle leaves in 1 quart of water to a sitz bath to aid vaginal discharge.